About a year ago, I had a dinner party in which I had a Moroccan theme (I got the recipe ideas from the lovely Coby on Nigella.com, I haven't been able to find it again to post the link here). 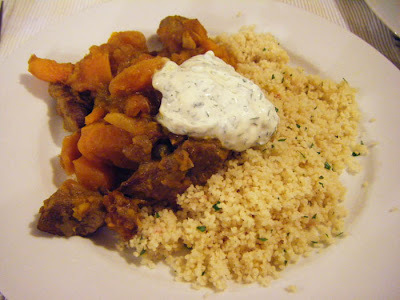 It was a fabulous meal with a lovely lamb tagine, some gorgeous spiced couscous and a couple of well worked salads, vege dishes and flatbreads to go with it. 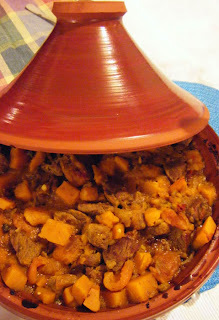 I made the lamb tagine in the crockpot which worked well and it was really delicious. As a result of how well the night went my dear husband decided to investigate buying me the real thing- an authentic tagine that is! He found a potter in Wellington who makes them, picked a red one and got it couriered here as a surprise early anniversary present. He was so excited about having done this all on his own and having done something original that he kept telling me he had ordered me something, and that I would really, really love it! Anyway, he hyped it up so much that when it actually arrived I was.......quite underwhelmed! At the time it was the kind of thing that I would quite like to have- but there were probably 20 other things I could have rattled off that I wanted before that came up. So we had a bit of a 'tiff' over it, me thinking how well does he really know me, him thinking what an ungrateful cow! Soak apricots in cold water to cover. Cut lamb into 2cm cubes. Grind some pepper over and mix through. Heat oil and butter in a large, heavy-based metal casserole (or frying pan). Brown lamb, a little at a time; don't crowd the pan. Turn cubes with tongs; remove as they brown. Reduce heat. Add garlic, ginger and onions. Saute on low, 2 to 3 minutes, scraping bottom of pan well. Add spices and salt. Stir in hot water then diced pumpkin. Combine with browned lamb. Cook in covered casserole in oven, 160 degrees celsius, for 1 hour. Drain apricots and add. Cover and cook 1 more hour until lamb is tender. Serve hot with rice or couscous and vegetables. 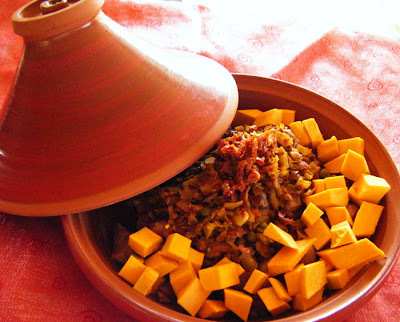 This tagine sounds really good & I look forward to making it soon!